Many a time, it might have stricken you that I wish I would have been able to automate the email followup to subscribers who have not viewed my emails yet…!! Your answer probably would have been “Many times“. Exactly, this is why MailGet has got a feature named as “Email Auto Follow-Up”. Email Auto-Followup feature allows you to automatically send follow-up emails to only those subscribers who have somehow missed to view your emails. In simple words, it gives you another chance to reach your subscribers and get engaged with them. With this feature, you would definitely be able to BOOM your email open rates and would ultimately generate high conversions through your email campaigns. STEP 1. Create an email. You can use any of the following builders for creating emails viz. Drag & Drop email builder, HTML and plain builder. STEP 2. After creating emails, you will proceed towards ‘sending email’ section, where you will be able to select your contacts to whom you want to send emails. 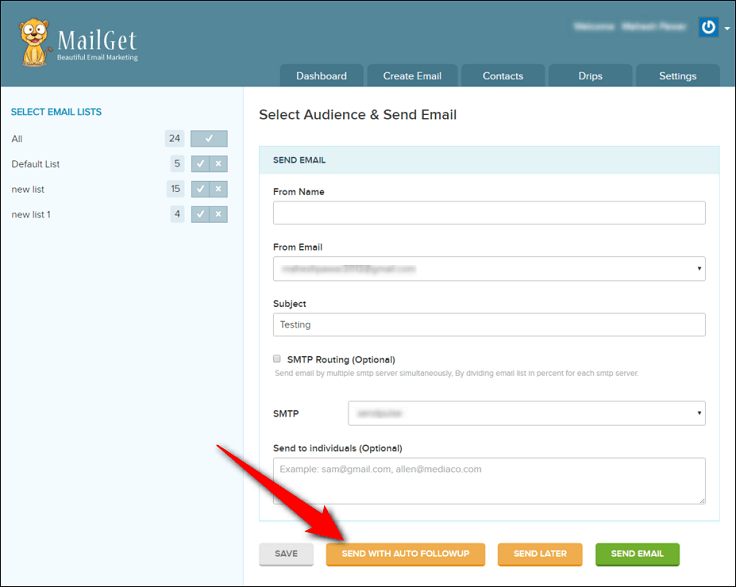 The best part is that here you will be able to find the email auto-followup option named as “SEND WITH AUTO FOLLOWUP“. STEP 3. Once you click on the “SEND WITH AUTO FOLLOWUP” button, another popup notification will appear as shown below. In that popup notification, you will be able to set the number of days after which the follow-up email has to be sent. Further, you will also be able to check the exact date and can choose the time as well. Hopefully, the Email Auto-Followup feature helps you to get bigger conversions with email marketing campaigns. Meanwhile, if you wish to automate your whole email marketing campaigns, then don’t miss out to check MailGet’s Drips Email Campaign feature as well. Pls let me give trial access of MailGet, to understand it benefits and features. This is a great feature and can’t wait to use it! The best is it does not count as extra emails.